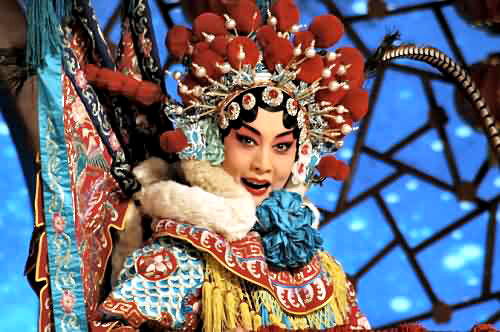 With its fascinating and artistic music, singing and costumes, the Beijing Opera (Peking opera) is China's national opera. Full of Chinese cultural traditions and tidbits, the opera presents the audience with touching stories, beautiful paintings, exquisite costumes, graceful gestures and martial arts as well as combining stylized action, singing, dialogue, acrobatic fighting and dancing to explain ancient Chinese myths and historical stories or depict various different characters, good or bad. 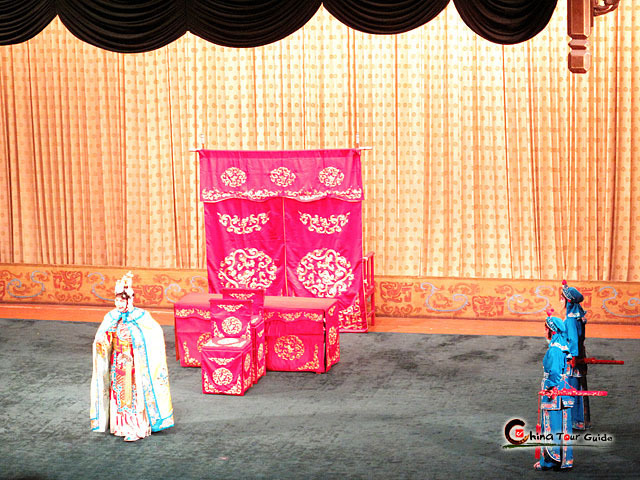 Nowadays, appreciting an authentic Beijing Opera Show in famous Liyuan Theater is a must-do when you are traveling in Beijing. The famous heroine Mu Guiying in traditional Beijing opera The leading Character of "Royal Concubine Yang of the Tang Dynasty"
The Peking Opera band mainly consists of an orchestra and percussion band. The former frequently accompanies peaceful scenes while the latter provides the right atmosphere for battles. The percussion instruments used most commonly include castanets, drums, bells, and cymbals. One person usually plays the castanets and drums simultaneously. These instruments direct the entire band with their rhythm. The orchestral instruments include tradition Chinese instruments like the Erhu, Huqin, Yueqin, Sheng (reed pipe), and Pipa (lute). The exact origin of facial painting is unknown, but its artistic value cannot be denied. The paintings are representations of the characters' roles. For example, a red face usually depicts heroic bravery, uprightness, and loyalty; a white face symbolizes a sinister, treacherous, and guile character while a green face denotes surly stubbornness, impetuosity, and lack of self-restraint. 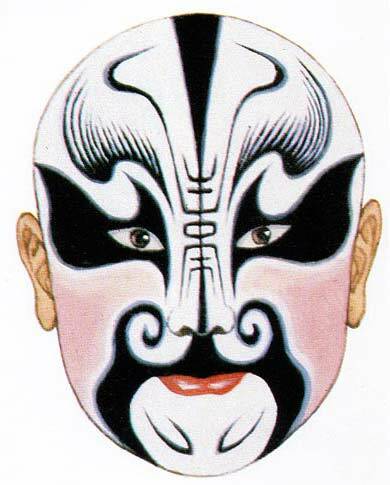 The unique makeup allows characters on stage to portray their traits and emotions silently. 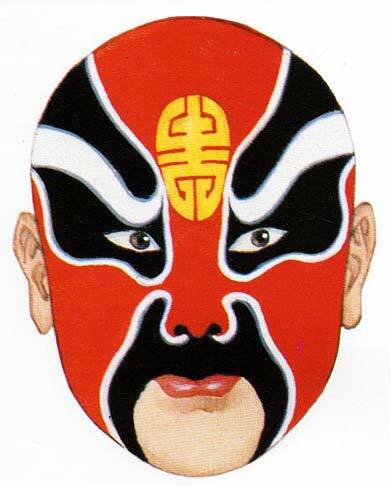 Peking Opera costumes are called "Xingtou" or, more popularly, "Xifu." The costumes are graceful and magnificent, expertly made in handicraft embroidery. Making use of traditional Chinese patterns, the costumes have a high aesthetic value. 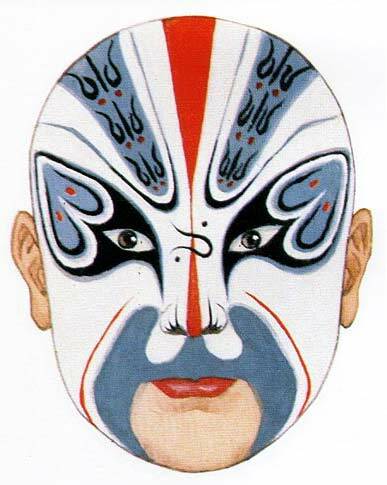 Since each dynasty in Chinese history had its own unique operatic costume, the number of costumes was too great for performers to master. Hence, artists and costume designers worked together to create costumes that could be used no matter when or where the action was supposed to take place. 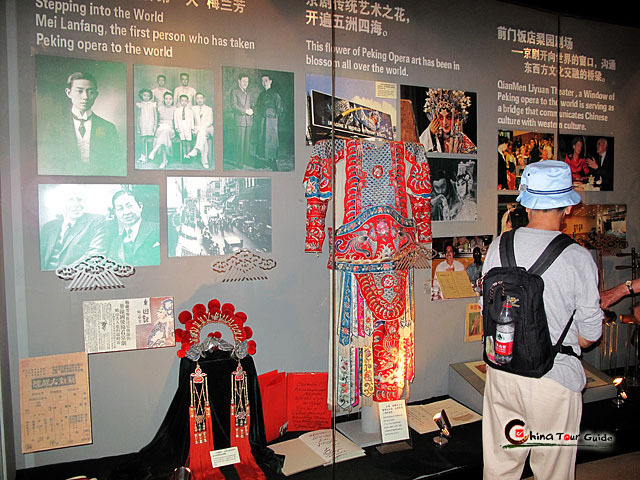 While a selected few masters dominated the stage in the past, since the 1990s a number of highly talented performers have emerged that help to demonstrate the continued importance of Peking Opera in Chinese culture. In recent years, the Peking Opera Theater of China has even started to experiment with incorporating western symphonic music in its productions. Peking Opera offers a vivid picture of Chinese culture and history and is a great way for visitors to get a taste of the country. One kind of female characters in the opera--Wudan, woman who is good at martial arts. 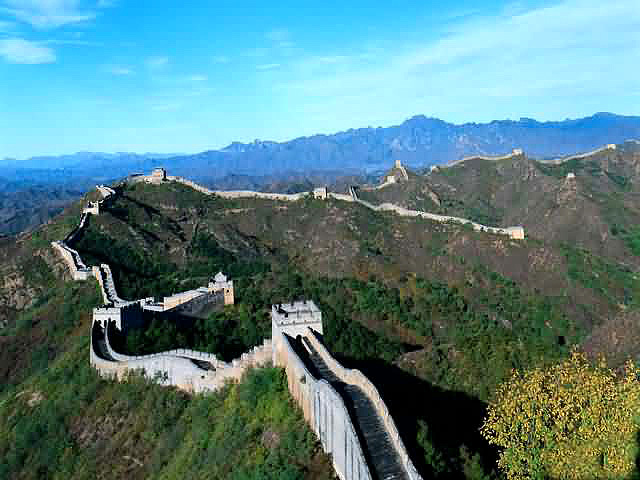 Nowadays, climbing the Great Wall, tasting Beijing Roast Duck and appreciating a Beijing Opera show have become three must-do activities for overseas visitors that you should never miss. 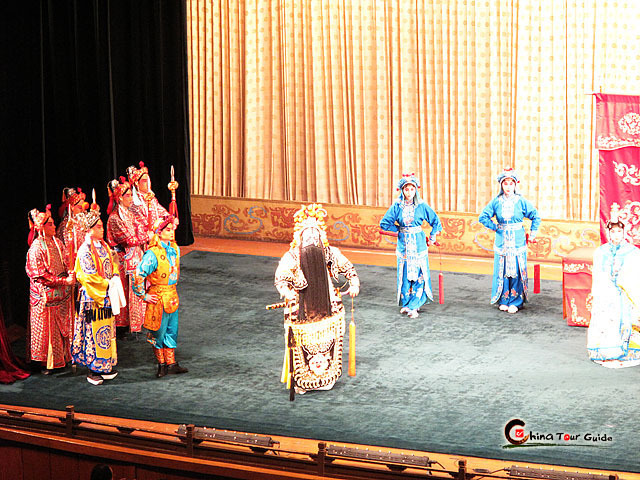 Of so many places where we can appreciate beijing opera, Liyuan theater ranks the best one with grand reputation in this circle. Beijing Liyuan Theater, regarded as the most popular beijing opera theater, welcomes thousands of audiences from all over the world. Famous Repertoires: Farewell to My Concubine, Goddess of Heaven Scattering Flowers, Eighteen Arhats Fighting Wu Kong,etc. Tips: Section 1, 2, 3 and VIP seats include Snacks & Fruits with table. Please see the below image for seat arrangement. After make payment online to us, the Ticket confirmation voucher will be sent to you via email. You will get show ticket(s) just by displaying our ticket confirmation voucher to our staff April who is waiting for you outside the theater at 7:00pm. With the ticket'the theatre staffs will help you to find the seat. 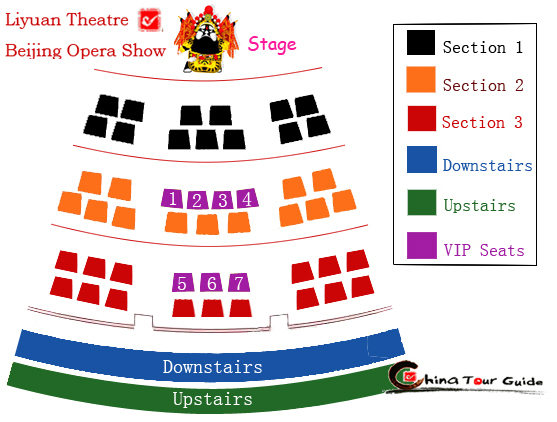 With a long-term contract with Liyuan Theatre, we can hold seats till 6:00 pm every show day. If it is already fully booked on the required day, we will inform you via email as soon as possible, ask if you need to change a show day, or need 100% refund. 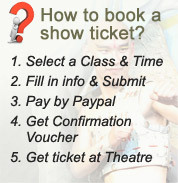 Thousands of our clients have paid through PayPal to book tickets in this way. In case when we find out the tickets have been sold out on the day you required, we guarantee to send 100% refund to your Paypal account immediately. Surrounding: City Center, Liulichang, the Qianmen business Street,etc. Metro Route: At the stop of Liyuan Theatre of Metro Line Batong. 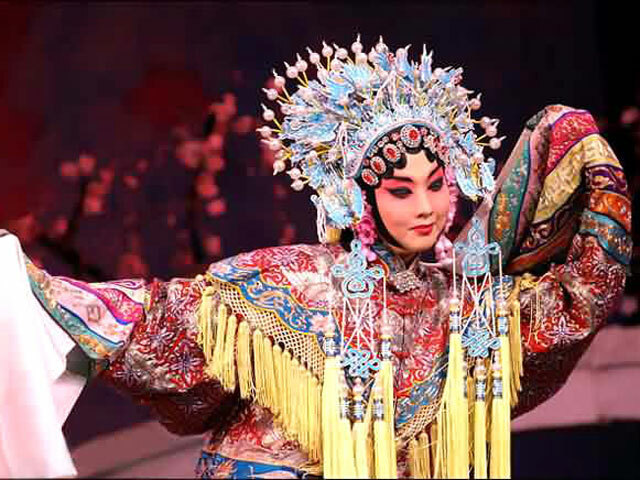 Beijing Opera features its colorful costumes and significant facial paintings, which can bring you an incredible visual impact. Before watching the show, fortunately you can take a look at the make-up process of every performer. It is exciting to see it, because at the old times commonly the make-up room was set behind the stage, and the make-up process was always being kept secrets. But now you can see the whole process and acknowledge that how these performers painted themselves with colorful inks. :) Enjoy yourself with taking photos of them! If you would like, even you can have yourself photographed after you putting on the opera costumes and the awesome make-up. It isn't very interesting?! Performers are painting their faces for the show. The Make-up process is open to visitors. The most wonderful charm of Beijing Opera Show is its fantastic Acrobatic fighting part, always attracting a round of applause. 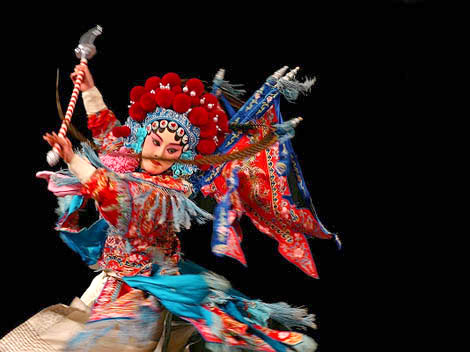 If you are a chinese Kungfu lovers, you can not miss the Beijing Opera Show! Actually the acrobatic fighting is regarded as the basic skills of opera artists, commonly a student of Beijing opera spends many years to practice these basic skills. On the both sides of the stage, screens of English subtitles are set to help you to understand the performers'lines. 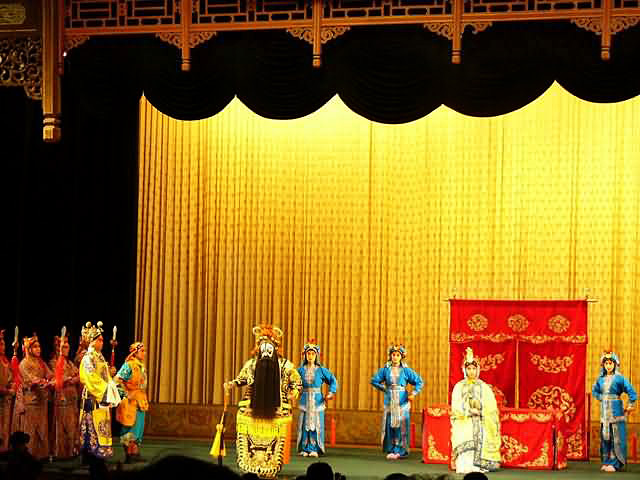 It's believed that appreciating the opera show is a outstanding way to understand the Chinese History and Culture, for all shows aims to present ancient Chinese myths or historical stories to you. 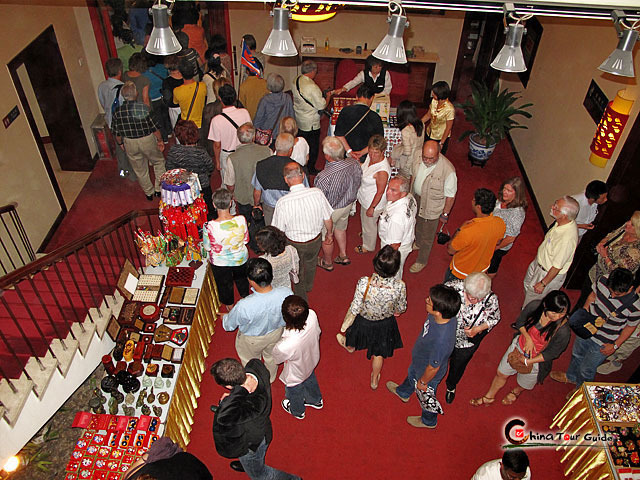 And more comfortably, you can have a taste of delicious local snacks and wonderful Chinese tea during the show! Turly a visit to Liyuan theater can leave you a wonderful memory for your whole life. 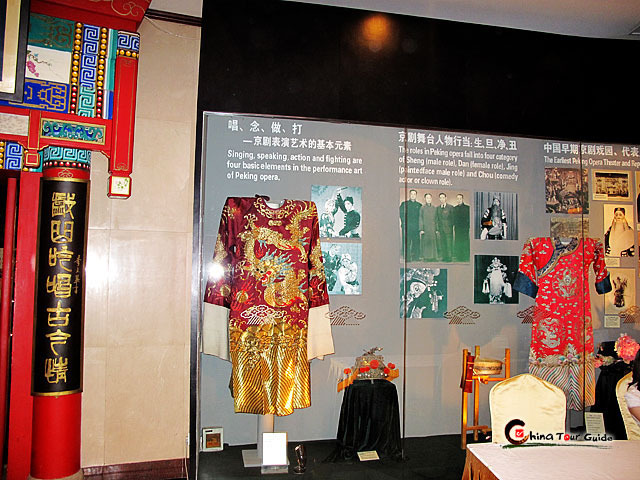 Liyuan theatre is located on the ground floor of the trendy Beijing Qianmen Jianguo Hotel, enjoying a very elegant and classic environment. A huge picture of many opera images, hanging up in the hall, can definitely catch your eyes. 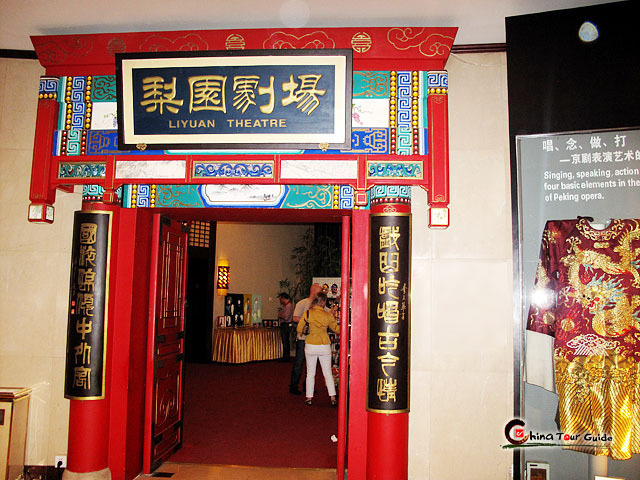 Liyuan theatre welcomes thousands of audiences and opera lovers from all over the world every month, and it runs daily a show in the evening. With a seating capacity of 800 audiences,the theatre has three zones for audiences, including VIP tables zone, the rear downstair seating zone and upstair seating zone. In VIP zones, you can taste delicious local snacks and chinese tea while watching the show. 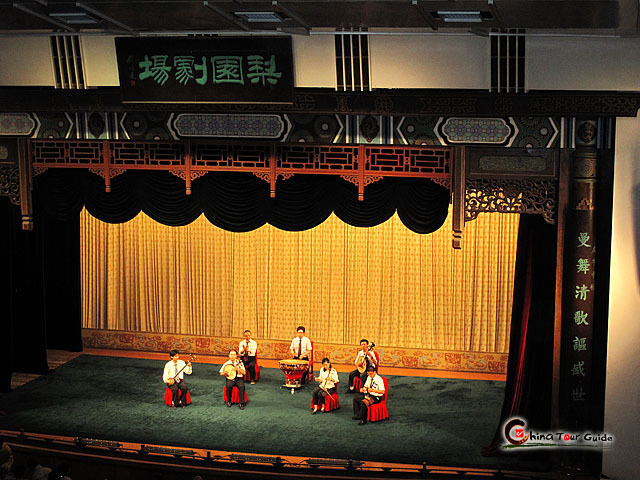 Surly a visit to Liyuan theater would be a colorful experience in your whole life. 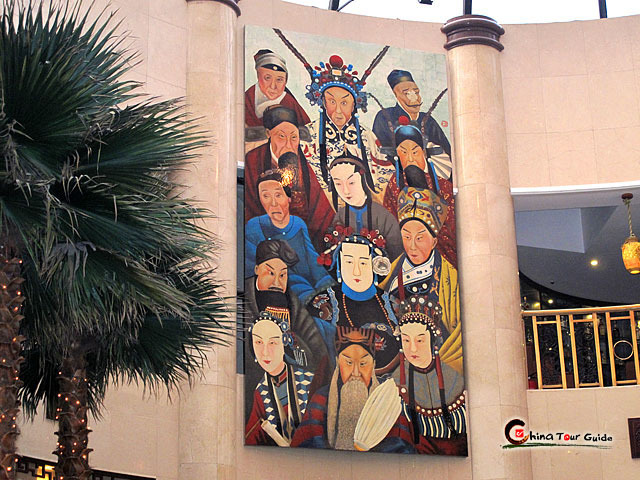 A Huge Opera Picture Hanging up Inside Qianmen Jianguo Hotel Beijing Opera attracts seas of audiences every month. Warring leaders Liu Bang and Xiang Yu agreed to a truce and drew a demarcation line at Honggou. Liu's generl feigned surrender to Xiang and then successfully lured Xiang and his troops into an ambush. Xiang and his troops were surrounded and couldn't break through. When his soldiers heard their folk songs sung from the enemy, they took it for granted that their fellow soldiers had given up fighting. and their morale went down. Xiang realized that the fight was lost and indulged in his drinks in despair. He bid fatewell to his lover, Yu Ji, who danced her last dance before killing herself with a sword. Though Xiang broke through the tight encirclement and got lost, he felt ashamed of seeing his countrymen and killed himself by cutting his throat by the side of Wu River. This is an episode of 'The Romance of the White Snake'. After Bai Suzhen (the white snake) married Xu Xian ,she asked Xiao Qing (the green snake) to steal sliver in storage of Qiantang County. Xiao Qing defeated the storehouse guards and stole the silver successfully. Sakyamuni heard that Vimalakirti was sick and asked Manjuari to lead all the disciples to see Vimalakirti. and asked the goddess to scatter flowers to bring fortune to him. The goddess departed from All Fragrant Land and traveled a long distance Four Sramaneras discussed Dharma and took care of Vimalakirti,and manjuari meditated with him.Then he goddess came and scattered flowers. Jiao Zan, a senior officer of the Song Dynasty, was exiled under guard to Shamen Island, for killing a treacherous court official. Marshal Yang ordered Ren Tanghui to protect Jiao in secret. Ren and Jiao spent the night at the Crossroad Inn. Innkeeper Liu Lihua believed that Ren intended to murder Jiao,so he stole into Ren's room and fought with him in the dark. Only when the innkeeper's wife came in with a candle did the three realize the misunderstanding. This is an episode of 'The Romance of the White Snake'. On the day of the Dragon Boat Festival, Xu Xian advised his wife, Bai Suzhen (the white Snake Lady, to drink some medicated wine. At her dead drunkenness, Bai showed herself in her true colors: a white snake. At the sight of this, Xu died of fright. To revive her husband ,Bai went to the Forbidden Mountains to steal magic herbs.There she founght with the guardscrane boys and deer boys-and found the herbs she wanted and revived Xu. In Song Dynasty, Scholar Pan Bizheng, nephew of the old nun, while preparing for the official test at the nunnery, became acquainted and fell in love with Chen Miaochang, a young and well-educated nun. The old nun was furious and forbade them to continue their relationship,finally forcing Pan Bizheng to leave for Linan. After hearing this, Chen ran away from the nunnery in pursuit of Pan Bizheng. By the side of the Qiujiang River, she looked anxiously for a ferry boat. She met a jocular, elderly boatman, who intentionally delayed her with tricks. At last, the boatman helped Chen Miaochang catch up with her lover. 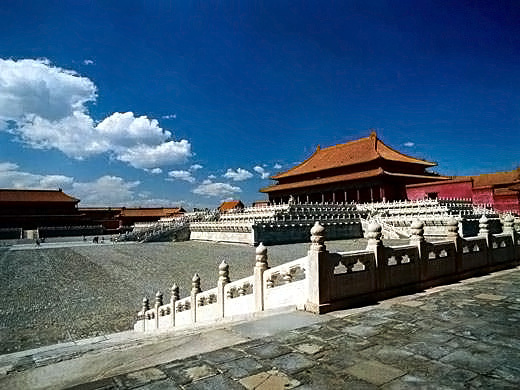 During the Ming Dynasty, a young scholar named Fu Peng admired and fell in love with Sun Yujiao,a beautiful young girl. He deliberately dropped his jade bracelet in front of Sun's house. This, however, was seen by Madam Liu, a matchmaker, who later asked Sun for an embroidered shoe as a love token, and promised to act as matchmaker for the two youths. 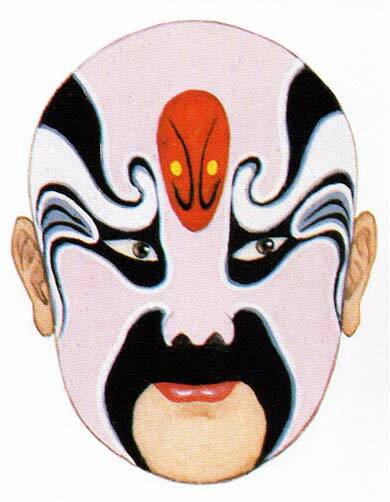 This play is based on the Chinese classic 'journey to the West', Sun Wu Kong wreaked havoe in Heaven and was thrown into the Eight Trigram stove of the Supreme Lord Laotse. Unespectedly,Sun Wu Kong was not burned to death under the high temperature,but instead his eyes became fiery and his pupils golden. He broke the stove and fled Heaven. The Jade Emperor then asked the help of Buddha, and Buddha led the eighteen Arhats to caprure Wu Kong. Wu Kong, using his magical powers, defeated the eighteen Arhats and returned to the Mountrain of Flower and Fruit. The eight immortals attended the birthday banquet of Queen Mother and got dead drunk. On their way home, they had to cross the raging East Sea. Each used his own skills and power to do it, which agitated the East Sea and the Fairy Goldfish. The Fairy Goldfish argued with the Eight Immortals; and the Eight Immortals felt indefensible and pretended to be drunk and fought with the Fairy Goldfish, but were defeated. They apologized to the Fairy Goldfish and then crossed the sea. 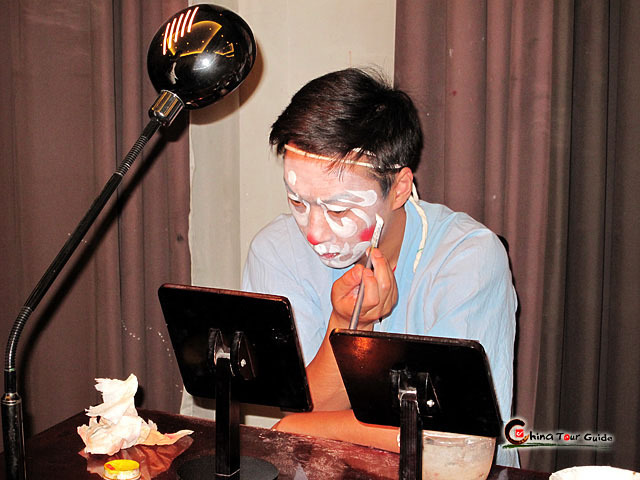 An Opera Artist is doing Make-up for himself.